One of the great things about National Parks, Yellowstone included, is that visiting them doesn't have to cost a lot of money. In fact, aside from park fees and a campsite, most activities and attractions in Yellowstone National Park are totally free. So if you're looking to keep your vacation spending down, here are some of Yellowstone's best budget vacation ideas. You won't have to break your budget getting in; seven-day permit entrance fees for Yellowstone National Park are just $25/vehicle; $20/snowmobile or motorcycle; or $12/hiker, biker or skier. When it comes to budget, camping out is the way to go. It doesn't cost much for a campsite – they start around $12/night – and most of us have an old sleeping bag and tent we can pull out of the closet or borrow from a friend. If you'd like to forego all camping fees, you may be able to find a free place to camp on some of the Forest Service or BLM land outside Yellowstone. 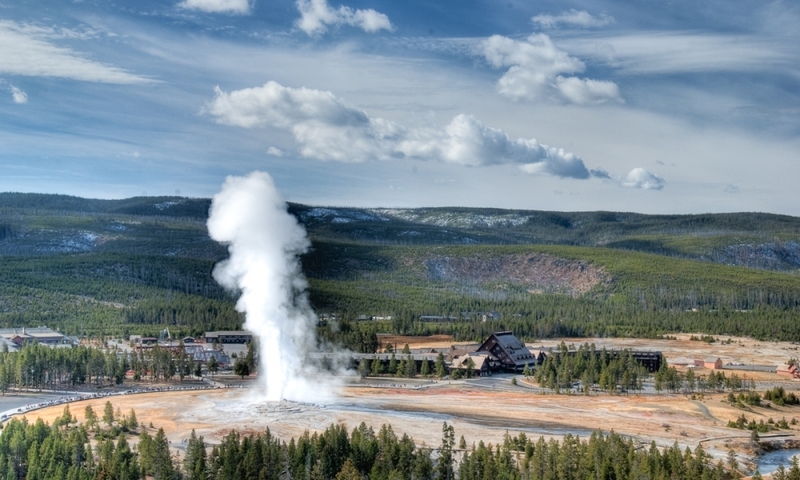 If camping just isn't in your cards, our Yellowstone Lodging Guide has budget options, as well. Most lodges within the park cost a pretty penny. You'll be able to find more affordable hotels and motels in nearby towns but in the heart of the summer months even “budget” motels jack up their prices. Since there's no public transportation to or within Yellowstone National Park, visitors usually drive, fly in and rent a car or arrive by bicycle. For those flying into the region, there are six airports just outside of Yellowstone , found in Bozeman, Billings and West Yellowstone, Montana; Idaho Fall, Idaho; and Jackson Hole and Cody, Wyoming. Flights to many of these smaller airports can be expensive (since flights into Jackson Hole are subsidized, it may have the cheapest fares of the smaller, closer airports), so if you want to save a little bit more money, it may be cheaper to fly into Salt Lake City and rent a car there. Relatively inexpensive compared to the pricey lodge restaurants. Grocery stores outside of the Park (check West Yellowstone and Gardiner) will be you cheapest dining option. A fishing license is cheap ($15/3 days, $20/seven days, $35/season), and fresh campfire-fried trout is a meal to rival the best fillet mignon from the Yellowstone Hotel. 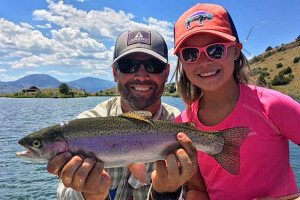 Grab a rod and reel and head over to either Firehole or Gibbon River. 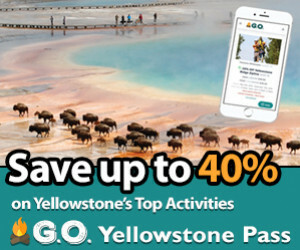 So many activities and attractions within the park are free (after you pay the entrance fee) that you can follow our suggested Yellowstone Summer Itinerary [link to Summer Itinerary] for ideas of what to see and do in the park. One of the best (and often overlooked) services that the park offers is a variety of Ranger Programs, including guided hikes, campfire programs, and more. Your seven-day pass to Yellowstone National Park is good at the Grand Teton National Park gates, too. Located just south of Yellowstone, the Tetons are filled with hiking, climbing, backpacking and more. Just outside of Grand Teton National Park to the south of Yellowstone, Jackson Hole, Wyoming is one of the classic Old West tourist towns. There's not a ton of budget options for dining and lodging here, but during the summers there are free concerts at Teton Village, a few free events in town, and plenty of great hiking and biking trails. Located at the West Entrance to Yellowstone National Park, West Yellowstone is a happening place in the summers, with the free Music in the Park concert series, beautiful scenic drives, mountain lakes and the Mountain Man Rendezvous. Just past Yellowstone's East Entrance, Cody, Wyoming has its own free summer concert series, a nightly western gunfight show, the McCoulough Peaks Wild Horse Herd and more. Budgeting is important, but so is splurging a bit now and then. If you decide you want to drop a bit of cash on a horseback ride or whitewater rafting, here is the spot. You can also head a bit further north to take a dip in the Chico Hot Springs (under $10 for a day pass). The small towns of Cooke City and Silver Gate, at the Northeast Entrance, may not have a lot going on, but they are the gateway to the Chief Joseph and Beartooth Scenic Byways. There are also a number of hiking and camping options in this area.